Sometimes your décor calls for a touch of the spooky. If you want to add a little macabre to your decorations try out one or all of these ghoulishly fun candle holder ideas. Simple and inexpensive to make- all items were picked up at Dollar Tree or found around the home. Festive and fun decorating can be frugal too with a little imagination, and a trip or two to your local dollar store. I used less than half a pack of eyeballs from Dollar tree to create this eerie candle holder. You could easily get 3-4 of these to place around your home or for your Halloween party. Fill Candle holders with eye balls, fill remaining space with water and 1-2 drops red food coloring. Place candle on top to complete the look. They also have rubber bloody fingers and toes you can use to make another similar candle holder, using the same method with the water. A pack of spider web and 5 spider rings were only $1 at of course Dollar Tree, I used a very small portion of the webbing and only 2 spiders per candle holder. To recreate: pinch off about a golf ball sized portion of webbing, stretch to flatten into an approximate circle shape, place candle holder in center of webbing, pull up and stretch over candle-the webbing will stick to itself pretty well. Clip the ring portion off spiders, and attach to web. Print out THESE bat shapes or free hand cut your own bat shapes from black construction paper. In a small bowl mix a combination of equal parts water and Elmer’s glue to create a modge podge. With a paint brush apply a thin even coat of modge podge to candle holder, and the back of bat cutouts. Apply cutout to desired position on candle holder. Apply a layer of modge podge over the top of bat. Allow to dry 24 hours. This will cast delightful bat shapes on your wall when you place a votive candle to shine from behind it, place in a shadowy corner. Too cute to be frightening this candle holder will add a touch of Halloween whimsy to your counter top, table, or shelf. 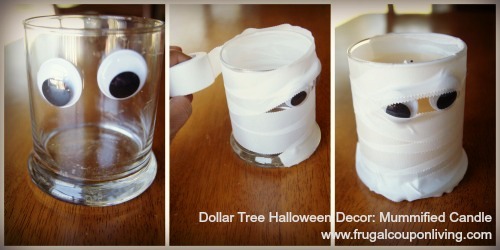 Begin by hot gluing large googly eyes on a glass candle holder. Apply a thin bead of hot glue to the base of candle holder. Press the tip of a roll of gauze bandage into the glue and smooth. Wrap gauze around the candle holder, leaving openings around the eyes. Press down with a small bead of hot glue. Alternatively you can use medical tape ( that’s what I did) Then you don’t have to mess with hot glue or any other adhesive, the kids can get in on this too! Love the Dollar Tree Halloween Decor? Find more Halloween Craft Ideas and the Dollar Tree Fall Decor – Decorate with Autumn Candles on a Frugal Budget! Awesome ideas! 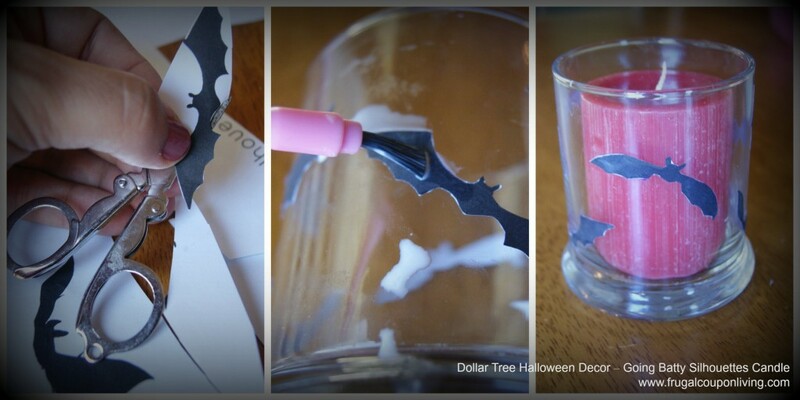 !This really is a simple and classic way to dress up candles for a spooky Halloween look.This is adorable! Will definitely give it a try! I am a sucker for inexpensive crafts! These are great! !